Are you suffering from hair thinning and are clueless on how to get rid of the same? Maybe the increasing intensity of hair fall day by day has become a growing concern among not only women, but men as well. If you are one of those men in UK, who is worried about hair thinning then this blog is going to be really useful to you where we have tried to cover all that you need to know if you are suffering from baldness. Let us know the root cause for the hair thinning for men! Do you know that your hair has a growth cycle? If this growth cycle is disturbed, hair follicle contracts leading shorter and thinner strands of hair. 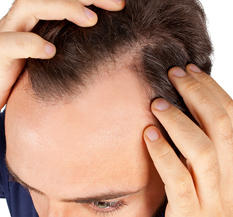 Few points have been mentioned for you to know what leads to hair loss in men. Genetics: A hormone named androgens cause hair loss in men who has a family past of baldness. Medical issues: Certain illness causes hair loss such as cancer, thyroid, anabolic steroids and so on. Stress and depression: These conditions send your body in shock which may lead to telogen effluvium which results in shedding of hair. Mineral deficiency: Iron deficiency leads to less production of red blood cells which results in hair loss. Protein, vitamin B deficiency also causes hair fall. Infection: The most common infection that leads to hair loss is ring worm which is a fungus that grows due poor hygiene. Platelet Rick Plasma (PRP) is a non surgical therapy that you can opt for incase you desire for hair stimulation and prevent further hair loss. Blood is extracted from a platelet rich area and spun in a centrifuge and unnecessary elements are removed. This is then injected in the rest of the scalp which later drives the growth of thick and better hair. This treatment is biocompatible and xeno free which minimizes complications and rejections. It is a simple, rapid and effective procedure for men of all ages. This procedure is antologous which means nothing artificial is being infused in the body. The patient’s own tissues are used for hair restoration. A mononuclear cell that is present in the platelet fights infection and enhances anabolic effects. It eliminates harmful cells in order to restore scalp with the best hair follicles. Another non invasive technique is mesotherapy. In this procedure, a solution rich in plant extracts, homeopathic medicine, vitamins and various other elements is injected n the scalp in order to rejuvenate hair. This solution targets the adipose fat cell to induce lipolysis and rupture dead cells. Mesotherapy is expected to get the right follicles at the right place. This effective hair rejuvenation technique has many benefits. We have mentioned a few. High success rate in comparison to other hair loss treatments. Targets major three problems of hair loss at one go: hormone imbalance, lack of proper nutrient and improper blood circulation. New and better hair follicles are grown with better survival capacity. Without going into much of medical details, we have tried to explain little non surgical treatment which is believed to be a definite cure for hair thinning for men. 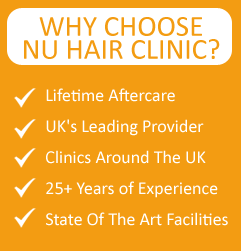 Majority of men in UK are relying on any of these hair thinning treatments and getting a rapid result as well. But before opting for any of this therapy, do consult the doctor and get a proper pre diagnosis done in order to know whether or not the therapy would be of help. This entry was posted on Friday, January 8th, 2016 at 9:35 AM	and is filed under Hair Loss Treatment, Non Surgical Hair Traetments. You can follow any responses to this entry through the RSS 2.0 feed. Responses are currently closed, but you can trackback from your own site.